Check the word "Services" in the Dictionary and you will find a variety of definitions to include: a) the work or action performed by one that serves; b) useful labor that does not produce a tangible commodity; c) providing services or producer of goods; d) offering repair, maintenance or incidental services; e) to perform any of the business functions auxiliary to production or distribution. 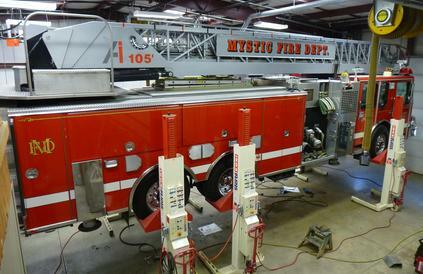 At Shipman's Fire Equipment, service has been a cornerstone of our business for over fifty years. Quite simply, we stand behind our products and support what we sell to ensure our customer goals and objectives continue to be met. To accomplish this, we offer a wide range of services to include, but not limited to; fire extinguishers, apparatus, breathing apparatus, rescue tools, and compressors. Shipman's has invested heavily in specialized equipment, vehicles and technical training of the respective discipline for our service personnel. * The Only Distributor offering Connecticut and Rhode Island the Full-Line of SCOTT Safety Products! 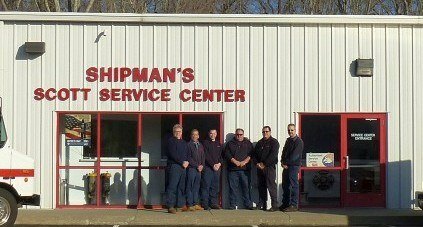 Shipman's has 5 qualified technicians on the road daily, and 4 in-house technicians maintaining and testing our customer’s extinguishers. We are prepared to meet all of your fire extinguisher needs - from the point of purchase, to installation, inspections, and maintenance. Extinguisher inspections and related services are conducted in-house, or at the customer’s facility when required. When necessary to remove an extinguisher for service, a loaner unit of equal UL rating is provided. Maintenance is performed and extinguishers are returned promptly. All extinguisher maintenance staff are NAFED certified, and all work meets the requirements of NFPA-10. The annual comprehensive program offers a complete and thorough service to your Holmatro system, ensuring that it meets manufacturer’s specifications for performance, pressures, and forces. Our comprehensive preventative maintenance program includes inspection, functional testing, repair, loaners, service maintenance record keeping, operational training and preventative maintenance training. The Shipman’s Advantage: Shipman's Fire Equipment believes breathing air should be maintained at the highest quality. Therefore, we have assembled a team of highly trained service technicians to service today's most popular compressors. Additionally, our parts department stocks the most commonly needed replacement parts to ensure fast, reliable service of your compressor. Air quality testing is done onsite by our trained technicians at testing interval of Annual, Semiannual, Quarterly, or on demand. Air quality test is analyzed by Trace Analytics laboratory to insure a third party level of quality.